You want to learn to sew, but you aren't sure if buying a cheap sewing machine is a good idea. There are plenty of inexpensive machines that can transition from beginner, through intermediate, to master sewist. In the sewing machine industry, you can still purchase cheap sewing machines and get years of use out of them. I purchased a Brother basic model back in the late 1980s to teach myself to sew. It is still my favorite little machine. It has been used to create everything from shorts and sleep pants to t-shirts, skirts, and business attire. Hemming jeans, making Halloween costumes for my daughter, and curtains for an entire house. It was even used to make industrial-grade commercial products using 69-pound thread and sewing through two layers of strapping to attach Velcro hook and loop. Over thirty (moderately abusive) years later, that is still my go-to machine for everyday sewing projects. 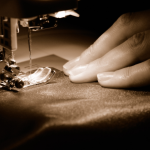 The first step in selecting a sewing machine is to determine what your needs are. What do you plan to do with it? Will you need a wide variety of stitch styles or just a standard array of the most common stitches? Will you be making clothing? Costumes? Curtains or drapes? Ask yourself as many questions as you can think of about what you plan to do with your sewing machine. The answers will guide you in making a wise selection for your first sewing machine. While we could keep adding to our list, we won't. Most sewing machine retail stores will have several machines set up that you can "test drive." Plan to spend several hours there and machine hop. Check out the features, and have a sales associate explain things that aren't familiar to you. Sometimes that feature we desperately need might be the one we didn't even know existed. The majority of cheap sewing machines on the market are built with quality parts and made to last. Manufacturers still believe in crafting a quality product. They can sew through several layers of denim or more substantial fabric. Cheap sewing machines should not be confused with toy sewing machines. Many smaller machines are low-maintenance. Oil them and keep them clean. With proper care, these cheap sewing machines will deliver years of use and sew through hundreds of yards of fabric. 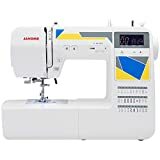 While there are many manufacturers of sewing machines, not all of them produce cheap sewing machines suitable for beginners. The two most well-known brands that do cater to beginners are Brother and Singer. Both have been around since the dawn of time (or so it seems). 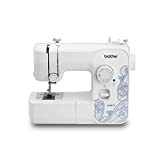 We found a few others that also produce good quality cheap sewing machines that will bring a lifetime of enjoyment to the sewing room. Brother International, founded in 1954, originated in Japan and currently employs 17,000 people. They conduct business in more than 100 different countries. Their United States headquarters is in Bridgewater, New Jersey. They also maintain a vast distribution center in Tennessee, spanning a million square feet. They have sales and support staff around the US. While Brother manufactures more than just sewing machines, they continue to put quality workmanship into each machine they produce. A few of their cheap sewing machines made our list. This little machine is probably one of the most basic Brother models currently on the market. It is also one of the least expensive models we found. This machine arrives packed with features, including 17 built-in stitches and a four-step automatic sizing buttonhole. The Quick-set bobbin system is jam-resistant, uses a clear bobbin and has a drop-in loading system with a clear view bobbin cover. This allows you to see how much thread remains on your bobbin during a project. There are four extra sewing feet included for special projects. A bright LED light illuminates the work area. Upper thread tension is easily adjusted with the control dial to avoid having loose or puckered stitches. It includes a free arm, which allows you to sew sleeves and cuffs easily. An instructional CD shows customers how to use their new sewing machine. After reading the reviews, most of the lower rankings on Walmart had to do with problems with the store, not the machine. Previous customers had returned machines without all the bits and pieces, and the items were placed back on the sales floor as new. The customers who were satisfied with this little machine were delighted and wrote glowing reviews. At the higher range in the Brother line-up is the HC1850, which is a fully functional quilting, sewing, and embroidery machine that can sew simple monograms. With the features included in this machine, you might expect the price to be out of our range, but affordability is great. Available at Amazon and many other online and local retail stores including Walmart. This machine is far from average when it comes to cheap sewing machines. With 130 built-in stitches, there is very little that this machine can't do. In addition to having many decorative stitches, this machine has eight different styles of auto-size one-step buttonholes. There are eight specialty presser feet included. These accessories increase the capabilities of this little machine. The spring-action quilting foot, coupled with the detachable wide table, allows this machine to perform free-motion quilting. The monogramming foot and 55 included monogram stitches make monogramming easy. The features just don't quit. This machine has a Quick-set drop-in bobbin, a simple bobbin winding process, and a self-threading needle. The simple threading system makes it a breeze to set up to start sewing. The machine works with or without the foot controller pedal. The LCD is backlit, making it easy to see and use the push-button selector to change stitches. An adjustable sewing speed and LED-lit work area make it easy enough for beginners and versatile enough for seasoned veterans. Brother includes a DVD with useful tutorials and a bilingual user manual. The manufacturer also includes free phone and online technical support. Not just for a year -- for the life of the product. ​Comments extoll the virtues of the machine and the ease of use. Some of the negative comments were that the machine frequently jammed, rendering it unusable. The majority of the positive comments included some variation of "I love this machine" or "best machine I've ever owned." The most repeated tip from current owners is to watch the included DVD before you begin using this machine. Another great little machine by Brother International is the CS6000i, a combination quilting and sewing machine. This little machine can sew up to 850 stitches a minute and is very user-friendly. It has an easily adjustable speed control so that you can set the pace that you work. The stitch selector allows you to choose the stitch you want from the 60 available stitches quickly and easily. While the machine arrives equipped with an extra large table for more significant projects and quilting, the table extension is removable. This free arm feature allows you to quickly shift to shirt sleeves or cuffs, and smaller projects. Brother seems to have thought of almost everything with this machine. It includes a dual-language user manual and a DVD to show buyers how the machine works. With the free online and phone technical support the only thing they missed was the kitchen sink. The low cost of this machine belies all the features it has. You can buy this little powerhouse at Walmart, Amazon, other online outlets and many free-standing retail stores in your local area. Out of more than 7,000 reviews on Amazon, most are positive. Users discuss the ease of setting up this machine for first use, for both beginners and seasoned users. The most consistent complaint was that the machine had difficulty with thicker fabrics or transitioning over existing seams. Many of the other complaints are most likely user error due to not setting the tensioning correctly. In 1950/51, Isaac Merritt Singer developed and patented the first sewing machine designed specifically for home use. The Singer company has continued to produce quality machines that are affordable for over 165 years. In 2017, Singer jumped into the computer app field with their innovative Sewing Assistant App. The app provides on-the-go assistance for your sewing machine troubles, questions, and general help to keep your sewing projects on track. Singer offers a full array of free online video tutorials. From your first stitch to the complexities of threading a serger, they seem to have tried to cover everything. If you're into speed-sewing, this little machine hums along at 1,000 stitches per minute. The base model is the 4411, which includes 11 standard stitches driven by a strong motor and housed in a heavy duty metal frame. It has a stainless steel work area over a top-loading drop-in bobbin system. This machine includes an automatic needle threading option with fully adjustable stitch sizing, including length, width, and density. There are three needle positions. With the included Quick Start guide, you can be sewing those Halloween costumes in no time. The model 44S is available at Amazon, Jet, and Hayneedle online and at various local retail sellers such as Home Depot and Walmart. Pricing varies drastically depending on the retailer and the number of pre-programmed stitches. It is available in a light grey or the standard white (grey costs extra). With just under 1,700 reviews, 66 percent of the Amazon reviewers rated this machine at 5.0 stars. The Singer 44S model is a base model that is available with different stitch counts. The model 4411 has 11 stitches, model 4423 has 23 different stitches, and the model 4432 has 32 stitches. This will make a difference in pricing and machine capabilities when purchasing, so be aware. If you're expecting 32 stitches and you order the 4411, you will be coming up short. This machine has a simple push-button stitch selection and size adjustment levers on the front panel. There are 30 stitches pre-programmed, and all have adjustments for different stitch length. There are 13 needle positions, a drop-in bobbin system, automatic needle threader, and automatic tension adjustment. A removable accessory compartment turns the sewing deck into a free arm attachment for sleeves and cuffs. The workspace is well-lit with an LED light. While it carries a limited 25-year warranty, if you use it outside the US or Canada it will not be covered. The Confidence 7463 ships with a lot of accessories, including a seam ripper, lint brush, a dust cover, a needle plate screwdriver, and much more. Five different presser feet increase the versatility of this machine. The people who reviewed this item on Amazon seem to either love it or hate it. With the 5-star and 1-star ratings split at 52 percent and 38 percent, respectively, the people who love it outnumber those that don't. A bit more to the expensive side of the spectrum. It is available at Amazon. Hayneedle, and brick and mortar establishments like JoAnn Fabrics and Walmart. Juki America, Inc. opened in 1974, but the parent company, Juki Corporation, has been operating for more than 75 years (since 1947). Their headquarters is located in Tokyo, Japan, while Juki America is in Doral, Florida. They maintain a worldwide presence and operate in over 170 countries. To provide better customer service and sales, Juki established an authorized distributor network. Distributors, trained by Juki, provide marketing, technical assistance, and support throughout the Western Hemisphere. 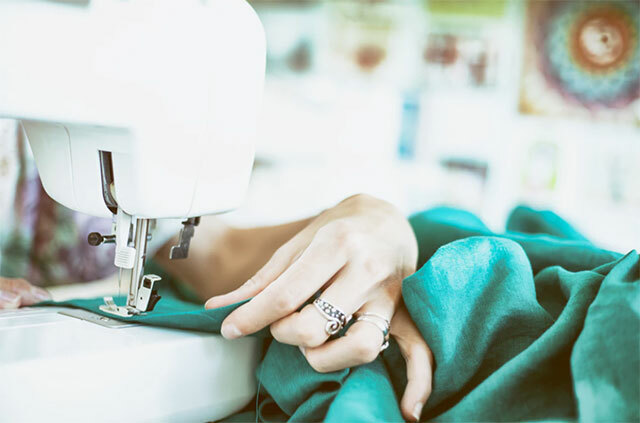 While many Juki machines target the commercial sewing market, they are a formidable component of the home sewing machine market and are becoming increasingly popular with home users. Many people submitting the lower ratings had prior experience on Juki industrial machines. They expressed disappointment at the lower-performing household models. Many of the comments refer to the larger Juki machines and compare them to these smaller machines. 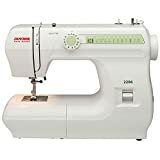 We know that comparing apples to oranges never works, so please keep that in mind if considering one of these cheap sewing machines from Juki. With no more than 18 reviews on any of the three models, there isn't much to judge. 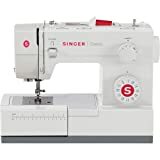 As a frequent sewing machine user, I would not personally rule out these models based on such a small smattering of reviews. I would, however, visit my local sewing center and test drive them rather than opting for sight-unseen online purchase options. Better known as simply Janome, this Japanese company has been making sewing machines for almost 100 years. They have an American facility, Janome America, in New Jersey. They are a world leader in sewing machine production. Janome holds the distinction of introducing the world to programmable sewing machines. They developed the Memory 7 machine in 1979 and continued to produce quality and innovation in the field. There are rumors in several reviews for Janome machines that they do not honor the included 25-year warranty on their machines. They do, but there is a catch. You need to purchase your machine through an authorized dealer. The good news is that they maintain a handy list of dealers on their website, searchable by zip code. Even better - Amazon is a registered Janome dealer, so purchases from Amazon do fall under their warranty. A word of caution here -- if you click the link on Amazon that says something like "Available at other dealers," those sellers may not be authorized dealers even though they are selling through the Amazon platform. This little powerhouse has 30 pre-programmed stitches. It utilizes a simple drop-in bobbin with a see-thru cover so you can monitor thread usage. With one-hand needle threading, it is a breeze to get started. While made for the home sewing market, this machine has a specialty needle plate and a 7-piece feed dog system (those are the little grooves that "walk" your material across the work surface). The LCD is backlit and has easy-to-use keys for stitch selection. There are three available one-step buttonhole stitches. There are four presser feet included and a free arm for cuffs and sleeves. Many of the less than favorable comments related to the light weight of the machine and use of plastic components. Some users had difficulty with tensioning adjustments. The positive reviews were glowing. The Janome MOD-30 can be purchased online via Amazon and Hayneedle, and at local retail stores JoAnn Fabrics and Home Depot. The Janome MOD-Series has a total of 7 versions, each with slightly different features. The number of stitches is the most notable difference. Because this affects pricing, those offering less than 30 stitches will be less expensive, and those over the MOD-30 will be more expensive. For a base-level machine with only 12 available stitches, this little Janome might be just what you need. Unlike its computerized siblings, this machine is mechanical. There are manual tensioning control and adjustable stitch lengths. It can sew up to 1,000 stitches per minute, has a front-loading bobbin, and free arm. Stitch patterns change quickly with a dial on the front of the machine. It includes a four-step buttonhole stitch among the 12 stitch patterns. There are snap-on presser feet to quickly change from zigzag to regular straight-line stitching or to make a buttonhole. The work area is well-lit with a bright light. You will have to deal with manual threading and a manual reverse, but it does have automatic bobbin winding. 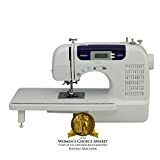 This is promoted as an entry-level machine and is great for beginners or seasoned seamstresses with no need for all the fancy bells and whistles. This model is available at JoAnn Fabrics and many online outlets including Amazon. If you opt for this model, please make sure that you purchase it from an authorized Janome dealer. Customer satisfaction with this machine is very high. Out of 447 posted reviews on Amazon, 409 were positive, and only 38 had negative ratings. The positive comments rave about the simplicity, ease of set up, and efficiency of the machine. The negative reviews complain of jammed needles, a voided warranty due to purchasing from an unauthorized dealer, and wobbly stitch lines. The Janome Model 2206 is a little sister machine to the Model 2212, with many of the same features, but a lower stitch count. With only six available stitches, it is more fundamental and has a lower price tag. There are only nine reviews for this machine on Amazon, but seven of the reviewers gave this machine the full five stars, and one gave it four stars. The only negative review was a three-star rating with a comment saying the machine was good for small projects like quilt blocks. There are no reviews posted at JoAnn Fabrics and only two posts on the Walmart listing for this item. Both of those set the rating at four stars. The comments speak of the ease of use and general reliability of this little machine. These cheap sewing machines are brightly colored, well-built, and perfect for a younger seamstress just learning to sew. Janome is making a serious bid to join Brother and Singer in teaching the world to sew. 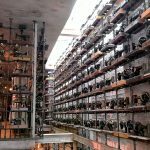 There is a free website available where you can check ratings for a variety of sewing machines. With machines listed by model number, it is easy to search. The scores combine customer reviews from a variety of sources. Some of their reviews are dated, but it is an excellent place to start if you don't see your machine listed above. We would be remiss if we did not stress the importance of due diligence in your pursuit of cheap sewing machines. Conducting adequate research when making what for some families is a relatively large purchase cannot be over-stressed. While we have our favorite machine, the decision on which one is right for you and your needs is solely your own. Almost all of the cheap sewing machines we looked at coming from the factory have a 25-year LIMITED warranty. Make sure you know and understand what those limits are. And be aware of where you are purchasing your machine. An unauthorized dealer may cause the warranty to be void before you even open the box. Amazon is a registered distributor for all of these machine brands. We hope you enjoyed our discussion of cheap sewing machines. Feel free to leave comments and let us know which machine you bought or already own and how you like it. Or if you have one that didn't make our list, mention that too.